If the first thing you check in a hotel is for plug points, you will be impressed with Centara Azure. Providing UK adaptable plug points, you can charge your iPad and phone anywhere. The pool is apt to enjoy gorgeous views and later swim up to the pool bar to get a drink. The Centara Azure Hotel Pattaya with a 4-star rating is a sought after accommodation in Pattaya. It is a stylish and modern hotel suitable for families, couples as well as business travelers. The interestingly designed, eclectic architecture, non-smoking environment, and tasteful accommodation make it a fantastic getaway destination. Guests can visit a number of nearby attractions like Ripleys Believe It Or Not, Central Festival Pattaya mall and Walking Street. The Centara Azure Hotel Pattaya features 96 rooms in an eclectic mix of styles and amenities. City and pool views are available from the modern and comfortable rooms. Children below the age of 12 can stay here at a free cost. The hotel is also within walking distance of the world-famous Pattaya beaches where guests can spend some leisure time. All rooms are compact, well-furnished, air-conditioned with individual climate control, comfortable and provide either city or pool views. The beach is just a few km away. Free WiFi, 24-hr reception, safe-box, ensuite bathroom with free toiletries are available in each room. American breakfast can be served in the room as well. Multilingual staff ensures a comfortable stay. Luggage-storage and laundry services are also available. One can make a choice from four room types based on their preferences. The in-room amenities and cozy vibe are sure to give guests the relaxation they need. All rooms in this hotel are air-conditioned with individual climate control, electronic monitors, free WiFi, flat-screen TV, minibar, en suite baths with toiletries, shower and fresh linen. A comprehensive range of kids services like babysitting, kids pool, kid-friendly buffet, are available. Special diet menus, fruit, wine are available on request. Spa and Wellness center, gym, jacuzzi, sauna, sun-terrace are some of the other facilities that guests at the hotel can avail. The hotel also has facilities to hold business meetings and conduct conferences. If one would like to relax in their room and enjoy local Thai and international cuisines, one can always order in from an extensive room service menu. 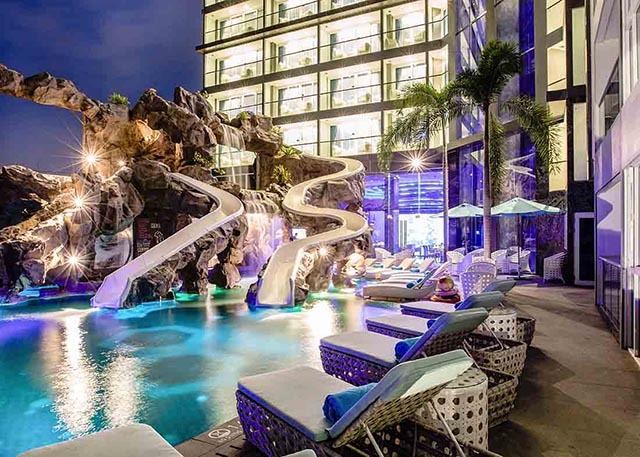 The Centara Azure Hotel Pattaya has a choice of three restaurants: Atlantis, The Rock, and the poolside swim-up bar Splash. The Atlantis offers both a la carte and buffet options, featuring both international and Thai cuisine. Vegetarian options are available. The setting is attractive, with a huge aquarium and metal sculptures to create an interesting ambiance. The Rock provides snacking options from the hotels own bakery. It is also a coffee shop that offers yummy pastries and savories. The Splash provides relaxation at the poolside with cocktails, drinks, and light snacks. Modern and stylish with state-of-the-art amenities, this hotel is located in Central Pattaya, within easy access of the famous Asian playgrounds, shopping malls, tourist attractions, water sports and nightlife. Is the Centara Azure Hotel located close to the airport? Yes, it is located about 30 km away from Pattaya Airport and about 86 km drive away from Suvarnabhumi International Airport in Bangkok. Yes, the hotel has a host of child-friendly features including kids buffet, snacks, fruits, chocolates, beverages, and kid-friendly menus are available on request. What are the room options for guests at Centara Azure Hotel? Guests at the hotel can choose from Superior, Deluxe Pool View, Deluxe City View, and Deluxe Family Rooms. What languages can the staff converse in? The hotel has a multilingual staff that can converse in both Thai and English. Is this hotel suitable for business meetings/conferences? Yes, the hotel offers full meeting facilities, conference room, fax, etc for small or medium sized groups. Boardroom, pre-function area, rooftop garden for al fresco cocktails, etc. For larger functions, the Pattaya Exhibition and Convention Hall is 10 minutes drive from the hotel. One can enjoy a fun-filled, comfortable vacation at the Centara Azure Hotel Pattaya. This ultramodern, medium-rise hotel has a wide selection of rooms to suit individual needs, preferences and budget. Located close to international and local airports, the hotel has a great range of facilities in-house like swimming-pool, free WiFi, parking, restaurants, shopping arcade, housekeeping, fitness, gym, spa, etc. Many other facilities are available on charge and the 24-hour reception desk is glad to help guests with all their requirements. If one prefers a quiet and restful vacation, Pattayas stunning coastline is within easy access. Shopaholics can indulge at the famous Pattaya shopping centers, malls, and local markets. With the variety of experiences and activities that guests can indulge in and around the hotel is sure to help them create some beautiful holiday memories.